Just as David defeated Goliath, you can win the victory over problems designed to hinder you. 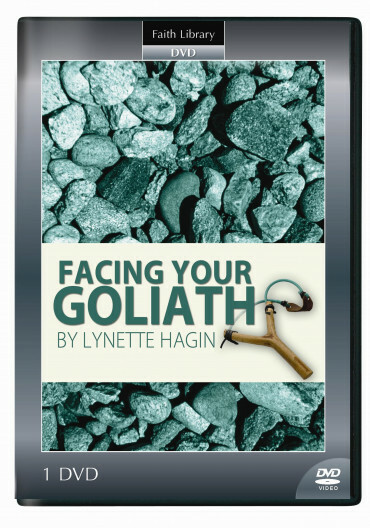 In this inspirational teaching, Lynette Hagin shows you how to overcome the giants of circumstances, attitudes, wrong decisions, opposition, and discouragement—by relying on an Almighty God! Do you find yourself facing insurmountable obstacles such as circumstances, attitudes, the fruit of wrong decisions, or opposition and discouragement? Don't fear. You can bring down these giants in your life just the way David defeated Goliath - with faith in God and all He promises you in His Word. On this inspiring DVD, Rev. Lynette Hagin teaches you how to face fears with a faith that liberates, empowers, and encourages, no matter what comes against you. With faith in God, you can take action, remain steadfast in the face of seemingly impossible odds, and rely on God all the way. Learn how to apply the Word, give God praise for all His deliverances and blessings, and declare victory over the Goliaths in your life!